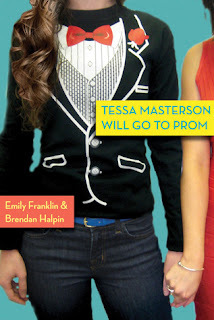 Lucas and Tessa have been best friends for so long, it seems almost inevitable that they will go to Prom together. 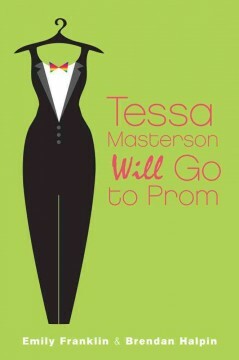 But when Lucas pops the question in a very dramatic and public way, he is crushed by Tessa's response. Not only does she say no, but she reveals that she is gay and wants to attend Prom in a tux with a girl for a date. In true teenage boy fashion, Lucas doesn't take it well and reacts without thinking. The result is a maelstrom of media attention, a huge controversy, and - most upsetting of all - the apparent end of Lucas and Tessa's friendship. Unlike most other YA books with gay characters, this isn't really a coming-out story, nor is there much about Tessa's relationship at all. It's more about friendship and supporting one another, but it's also fairly political, focusing a lot on the controversy, and you've got to give props to the authors for giving teens enough credit to be into that. Man, I wish I had read this book as a teenager, but of course we had nothing like it in the '80s. The only flaws were minor - just a few conversations early in the book that didn't come across as natural - and I quickly got past that. I don't think most readers would even notice. The characters were wonderfully imperfect. When faced with the first true test of their long friendship, neither Tessa nor Lucas responded in a particularly mature way, which is good - they're just teenagers and they are learning from this experience. Two-dimensional adult characters are common in YA books, but Lucas's mom was fleshed out with a personality and a history, and she was just fantastic. I also appreciated that the anti-Tessa crowd weren't complete haters. It's so easy to paint these situations black and white, but the authors didn't do that here. Some of them were totally anti-gay and protested in front of her family's store, but others were civil to her family and still supported their business. There don't seem to ever be enough new young adult books that aren't paranormal or dystopias, so I was happy to spend time with these regular kids in their small midwest town as they navigate the sorts of problems real teens face. As a bonus, the cover isn't terrible. I even like the paperback version, even though the cover model's head is cut off. At least she's not wearing a fancy dress. Both Tessa and Lucas were kids I'd be proud to call my friends, and I rooted for them - and their troubled friendship - the whole way through. In turn aggravating, nerve-wracking, and touching, this novel ultimately made me very happy in a warm, fuzzy glad-to-live-in-Massachusetts kind of way. I'm sorry it hasn't gotten more attention, but I'll be sure to recommend it to patrons at my library.